Purchase KING COHEN on Blu-ray Today! 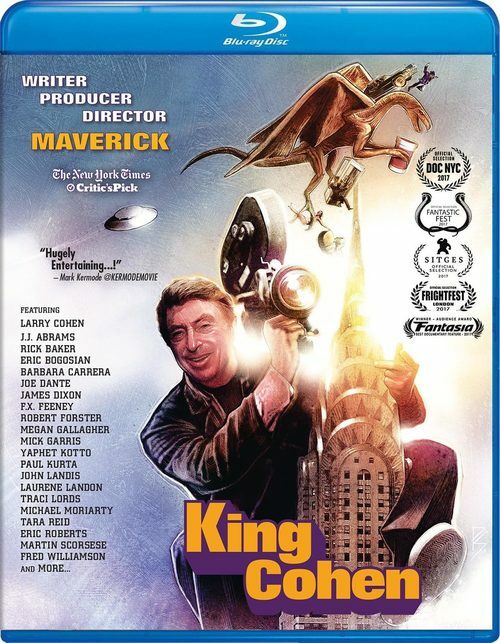 KING COHEN is a documentary with loads of interviews from Hollywood actors and directors that have amazing stories to tell about what it was like to work with Larry Cohen. There’s a charming allure to that of the stories and relationship that Fred Williamson has of Larry Cohen. In this blu-ray we get to learn of his life and journey into film making and writing from the moment he caught his break. I’m very glad a CD is included because the score for this Documentary is feature film worthy. COHEN was famous for shooting films in his own home, be it outside or inside and many jokingly speculated that he only bought the house for that very reason. While BONE was not successful it lead to his entry into blaxploitation where his relationship with Fred Williamson really took place. The film touches on how he accomplished a lot of his filming which was hilariously done a lot of times with out filming permits. Additionally there is great behind the scenes knowledge on IT’S ALIVE including its hiatus of release and into its smashing success. Lots of interviews by his peers and past colleagues and both his wife and ex-wife sharing great personal stories. Highly recommended, and worth a watch! KING COHEN comes to Blu-ray with a fine blu-ray transfer that does an exceptional job for the genre. Beautiful hi-def blu-ray brights and deep darks that lend to a great video transfer. How many Documentaries do you know that have a DTS-HD Master Audio 5.1 track? This screams the quality of those at hand. Someone who truly cares to give you a great product and experience as its equally important to he himself. Whether that credit is due to Cohen, Mitchell or both never the less it really makes the soundtrack from the master Joe Kraemer pop! Great use of rears while more frequently front heavy. A lovely soundtrack that is as loud as it is compelling whilst transitioning the film quite nicely from scenes. More than 100 minutes of additional SPECIAL FEATURES!